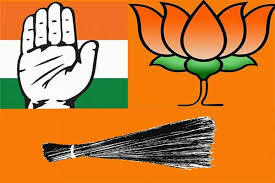 Goa News |Will AAP-type factors hamper the Congress, or the BJP? Perhaps this is the first time in the history of Goa’s politics, after the Opinion Poll of 1967, each and every party is completely confused and even nervous of what the result of 2017 Assembly election would be. Publicly they pose a brave front of winning (which they have to), but privately they admit the confusion the silent voter has created by throwing all their predictions haywire. I have been meeting several politicians as well as political analysts nowadays, who are busy making their own calculations and exploring different possibilities from the North pole to the South pole. These private discussions reveal that yet another factor is haunting their traditional calculations – the Aam Aadmi Party. The hidden fear in their mind is whether the silent voter has voted for AAP and will it make their prospects upside down, even if the AAP does not win the seat. And one common basis on which the calculations are made is that the AAP would split the traditional Congress vote and it would obviously benefit the BJP. Though this sounds logical at a face value, the figures speak otherwise. It sounds logical if a simple calculation is made on the basis of the vote share of the parties in 2012 Assembly election. But the picture become much clear and broader if the vote share figures are calculated of at least last three Assembly elections and the seats the major parties won – the Congress and the BJP. The table given below shows us that the Congress has slipped down from a simple majority of 21 in 1999 to a single digit of 9 in 2012. And the BJP rose from 10 (one fourth) in 1999 to 21 by 2012. The 2007 election had a background of two governments – the Manohar Parrikar-led BJP government and then the Pratapsing Rane-led Congress government. The 2007 election was held amidst a strong pro-Parrikar wave, in spite of which the BJP’s seat share reduced from 17 to 14 in 2007 while the Congress remained static on 16 and Digambar Kamat ruled the state with the MGP and others for five long years. This ‘stable’ and the most corrupt regime of the Congress made the Goans furious and even the traditional Congress voters as well as the other anti-BJP voters rallied around the BJP and Parrikar in 2012. It was the ‘conscious voter’ and the ‘conscience vote’ that turned the tables and pushed down the Congress to single digit of 9 and gave simple majority of 21 to the BJP to rule. 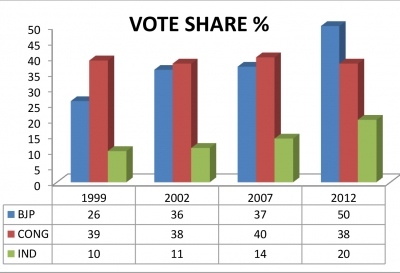 The graph given below clearly shows that the BJP’s vote share rose from 37% to 50% while the vote share of the Congress reduced by only 2% - from 40% to 38%. The share of independents also rose from 14% to 20% and people elected 5 independent MLAs for the first time in the history of Goa Assembly. The 2012 election had two major features: 1) People had decided to teach a life-time lesson to the arrogant and corrupt Congress, and 2) The voter had a ready-made alternative called Parrikar’s BJP. The 2017 election has three features: 1) People are feeling betrayed by the BJP due to its U turns and want to teach a lesson also to the BJP, 2) The Congress did not learn a lesson but proved to be hopeless opposition with its non-performance and 3) A new party called AAP emerged as an alternative but could not reach the height of the BJP of 2012. Learning a bit from its past mistakes, the Congress raised little hope with its state-wide Padyatra and giving 60% tickets to new and young faces. On the other hand, the BJP has totally relied upon the social sector schemes the people have benefited from and the construction-related infrastructure it has built. In this situation, it needs to be seen where the ‘conscious voter’ and the ‘conscience vote’ would go to: 1) remain with the BJP, 2) shift back to the Congress, or 3) shift to new alternative called AAP which is contesting 39 seats. There are also other alternatives made available like Goa Forward (4 seats), Goa Suraksha Manch (5), Goa Suraj Party (8) etc or the Independents, but not enough to form the government but only to support the governments led by either the BJP or the Congress. The parties like the MGP (25) or the NCP (17) are not looked upon as the alternatives since they were part of the corrupt regimes led by the Congress or the BJP. In this scenario, it is not the Congress vote share that would split due to AAP but the conscious vote of almost 20% that had voted the BJP to take them to 21. The factors of AAP or other small alternatives would thus hamper the prospects of the BJP more than the Congress, in case this ‘parivartankar’ voter thinks otherwise. If not, then nobody can stop the BJP from coming back to power with absolute majority. There was another factor in 2012 which press has ignored. Parrikar would like to present to the world that he did everything but the work to get that extra 13% to make it 50% from the 37% bjp already had was done by Vishnu Wagh. Today Vishnu is out of the equation first by usual backstabbing by parrikar and later due to bad health. The bigger question is if 2012 is considered a referendum in favour of Parrikar, if bjp fails in 2017 will you accept it as a referendum against Parrikar? And bjp will fail. They are not going to get that 50%.